“The LCY has a unique design employing twin ribbons of half the length of conventional ribbons in order to control vertical plane dispersion. 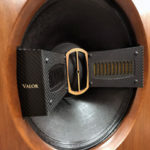 Thus, it reproduces both vertically and horizontally as effectively as voice-coil operated dome tweeters but with the accuracy, elegance and refined timbres of ribbon-tweeter technology. Magnetic flux density is enhanced by the use of our own neodymium magnet system and a sophisticated transformer with parallel multi-wiring OFC has been adopted for superior frequency and power handling and optimal size. The lower A3, contained in its own chamber, has a fixed low pass filter at around 400 Hz, also with a very slow first order roll-off, and serves as baffle step correction. For those unfamiliar with this concept: At high frequencies, the baffle is much wider than the wavelengths, so the driver output is directed entirely to the front, toward the listener. At lower frequencies the wavelengths are longer, and wrap around the baffle; much of the energy is thus directed away from the listener, though some of that energy will bounce off the front wall and ultimately reaches the listener, albeit at a reduced level. The frequency at which this occurs is largely dependent on the size of the speaker baffle; for the Troika it is from 400 Hz to 1000 Hz. The crossover is thus arranged so that the outputs of the two drives combine to yield a flat frequency response. 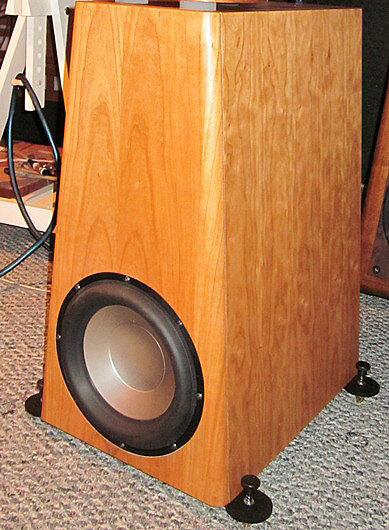 The lower A3 is in a ported enclosure from when it was used as a stand-alone speaker. In its current configuration, that is with the Olaf woofer, there is essentially no output from the port as it is tuned to 60 Hz, well below the low frequency cutoff range (use selectable) provided by the active cross-over. Because of the active crossover, two sets of interconnects are required. The first set goes from the preamp outputs to the inputs on the crossover panel located on the rear of the Olaf woofer. 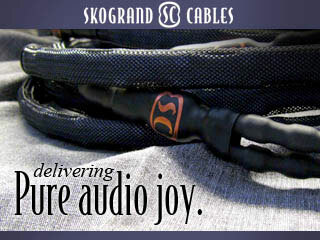 The input connection on the review speaker was balanced only; both inputs and outputs can be supplied as balanced or single-ended, or mixed; this must be specified at the time of ordering. As my preamp has only a single-ended output, although the new version being built for me will have both single-ended and balanced outputs, I used a single-ended-to-balanced adaptor on the speaker end. The incoming signal is divided by the crossover such that the lower frequencies are directed to the internal amplifier, thence to the woofer, and the higher frequencies are directed to the output on the Olaf rear panel labeled “HIGH PASS. The second set of interconnects goes from those outputs on the rear panel, to the inputs on the amplifier of one’s choosing. Speaker wires from that amplifier connect to the speaker terminals on the back of the Troika, from which the passive crossover directs the signal to the A3 drivers and the ribbon. As noted above, the crossover panel on the rear of the Olaf woofer contains numerous adjustments: 10 to be precise. Four of these pertain to the Linkwitz Transform. Vadim recommends not touching the two which are tuned to the physical resonance and Q factor of the woofer in this cabinet. 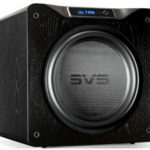 However, he encourages customers to experiment with “Boost,” which defines how much lower the new -3dB point moves, as well as with the new Q of the bass system. Vadim recommends Q=0.5, but this is a question of preference. The other adjustments are: 1) FC (i.e., crossover point); 2) LOW LEVEL, 3) HI LEVEL; 4) PHASE; and 5) DAMPING. 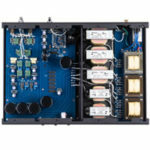 The High level and Low Level controls allow one to adjust the relative gain between the woofer and the mid/tweeters, which is necessary because the amp one uses for the tweeter/mids is likely to have different gain from the internal woofer amp. Moreover, bass gain is highly room dependent, so this provides a critical adjustment. The Phase control allows one to adjust the woofer phase, in relation to the phase of the tweeter/mids, or even in relation to the phase of the other woofer. This can correct for bass room anomalies but in actual practice, with the crossover set below 200 Hz (give or take), I heard very little effect. The last adjustment, Damping, adjusts the slope (i.e, Q factor) at the crossover point between the Olaf woofer and the Troika. We used the various adjustments to achieve the best balance of bass depth, and integration with the Troika. We positioned the speakers in the same approximate position as every other speaker I’ve had in my fairly large room (30’ x 22’ x 11’), and made only minor adjustments, mostly in toe-in. In their final position as measured from the front center of the speaker, they were 117” from the front wall, 65” from the side wall, 11’ from one another, and 11’ from the listening position. I began with them firing straight ahead but this provided too little upper frequency energy, so I progressively toed them in until they were pointing directly at my ears. This diminished the soundstage width so I toed them out slightly such that they were aimed approximately at my shoulders, which gave very satisfactory tonal balance and soundstage/imaging. 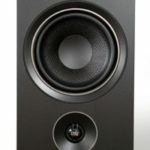 One of the benefits of a speaker with an active crossover and dedicated woofer amplifier, is that it relieves the main amp from the “heavy lifting.” Although the Troika has only modest sensitivity at approximately 86 dB, it has a benign and flat impedance, never dipping below about 7.5 Ohms. Together, these properties results in the system being compatible with relatively low powered tube amps. During the review period, I used four different amplifiers, two tubed, and two solid state. The solid state amps were the Sander’s Sound Magtech reviewed by fellow Dagogoan Phillip Holmes, and Merrill Audio Veritas (see Audio News)(both approximately 400 W into 8 Ohm), a pair of heavily modified ASL Hurricanes (100 W/channel, kindly loaned by Vadims’ customer Dr. Rob Paull, who also provided the speakers), and my own 30 W/channel Tube Distinctions hybrid monoblocks. The latter were my favorite but that is not a surprise, as these are amongst the best amps I have heard in my room. Importantly however, the sonic characteristic of each amp was readily apparent through the Troika/Olaf, indicative of the speaker’s resolving abilities, and its relative lack of coloration.